We know it’s winter, but we are already thinking about summer camp! Summer camp season is just around the corner and that means that it is time for Early Bird Registration for three of our popular summer camps. Each year, we respond to the needs for quality camps from our families who have children and adolescents with special needs. Our answer is camping options that are super fun and educational! 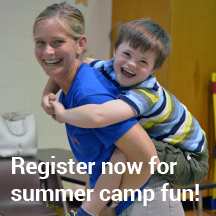 Register for CampAbility, Camp ROCKS or Camp FUEL between January 17 and February 28 and save $100 per session! Camp ROCKS is a 5-night/6-day outdoor camp experience at Bradford Woods for children and adolescents on the autism spectrum who are 10 through 18 years of age.